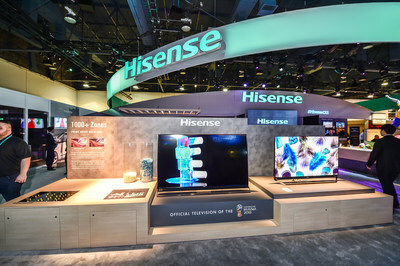 LAS VEGAS, Jan. 10, 2018 /PRNewswire/ — Hisense, a global technology leader, today unveiled its innovative 2018 TV line-up, including the breakthrough 100″ Hisense 4K Ultra HD Smart Laser TV, 1,000+ zones U9 ULED TV, and the bezel-less U7 ULED TV. Hisense continues to transform the TV viewing experience in 2018 with premium technologies like ULED, Quantum Dot, Dolby Vision™ HDR imaging technology and local dimming, and the next-generation, easy to use Hisense Smart TV platform with new voice control capabilities. In Q4 of 2017, Hisense introduced the revolutionary Hisense 4K Ultra HD Smart Laser TV in US, a product that represents the future of premium large-screen home entertainment. Displaying 3,000 lumens (typical) of stunning 4K images on an Ambient Light Rejection screen, the Hisense 4K Laser TV is nothing short of incredible. It also features a four-speaker built-in Harman/Kardon® audio system and wireless subwoofer, which provides a room-filling cinematic audio experience. After receiving extensive acclaim at launch, the 4K Ultra HD Smart Laser TV will be a key product for Hisense in the coming years. Combining ULED, Quantum Dot, Dolby Vision HDR, and HDR-10 technology, the 2018 flagship Hisense U9 ULED TV delivers breathtaking picture quality with over 1,000 backlight zones and a peak brightness of over 2,200 nits (typical). It also features a built-in Android TV interface with Google Assistant and built-in apps to personalize your entertainment. Awarded over 20 patents, Hisense’s ULED technology is up to three times brighter than OLED, with better dynamic range and perception of black and white while enhancing color, contrast, black level, brightness and smooth motion. The Hisense U7 ULED TV matches premium picture quality and elegant design. Combining ULED, ultra-wide color gamut and Dolby Vision HDR, and HDR-10 technology with a sleek bezel-less design, the Hisense U7 ULED TV truly is the full package. It features a built-in Android TV interface with Google Assistant, and lots of apps to personalize your entertainment. Press play, pause or turn up the volume, all without lifting a finger. Taking picture quality to the next level, the Hisense U7 ULED TV brings Wide Color Gamut, HDR-10 from the 50″ class all the way up to the 86″ class TV.